Serinox wrote: Also, Gosho has already introduced Rumi as the Rum suspect with the feminine aspect before Iori (yes, I know, "feminine man" and all of that, but still, she is clearly introduced as a Rum suspect and that's the aspect she fulfills the most). Kuroda drinks red tea, commonly associated to be a women's drink (hence Kansuke's comment about how a man with his scary face prefers female tea) and Wakita displayed quite the amount of girly expression's/"fan girling" during his introduction, though we kinda have to wait and see for more appearances to know how much of that was faked. Iori is more suitable as a Rum suspect, compared to Rumi. But I get your reasoning. Didn't know about that part. I guess that does serve as something. The Wakita one is a bit weak, since it was most likely just an act. Tantei San wrote: MeiTanteixX gr8 report on Wakita and Rumi. I have some points that I would like to highlight. Pretty much possible if she is not a BO member and possibly Kohji's GF and needs Akai's help, who was last seen with Conan. And was searching for him because well if Kohji's non blood brother is Shukichi, who is the brother of Akai and an FBI agent, it makes all sense. Also, The theory you said that she might be the uploader of Kohji's case online, but, if she was tracing one of the viewer, wouldn't it be Agasa and not Conan, because clearly Conan was checking the website at Agasa's place. then it wouldn't be a stretch if she was able to trace the people that visited the website, and that it eventually lead her to Conan. I had said that this could've contributed to the first way of finding out about Conan(which is through the Hotta Gaito case news). Why would Vermouth go all the way to become RUMI WAKASA, I mean why? Also choosing the name of Rumi Wakasa. She could have created another name. I mean yes, she created this to lure anyone related to the case, but if i am not wrong, all those related to it were killed already, Amanda Hughes, Tsutomu Akai as well as Kohji Haneda. ...For that reason, she might've been trying to provoke Conan, by making herself look like the prime suspect of that case, Asaka, in order to confirm her suspicion. k11chi wrote: Now you're letting your imaginations run wild too much. She was clearly introduced as an Ooka family member who live in a nice place with a butler or two, and is a high school student who wants to marry Heiji. She's a young girl while Rum is supposed to be old. I don't think that sounds like a Rum suspect. I was talking about Iori, and I was not saying he's Rum, but rather that he has potential to play a role in the plot and be utilized as a Rum suspect. Is there any other reason to consider him one aside from "He was introduced after 898 and it is not impossible"? Kuroda and Wakita also fulfill the feminine aspect to a certain extend after all. 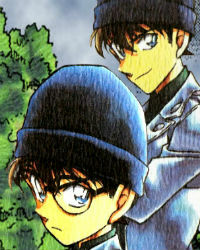 Gosho doesn't develop characters to the extent that he did with Iori(his sneaky nature, foreign knowledge etc.) without explaining them, unless they're important. His character design is too unique and fits the effeminate part easily. Unless Iori's character will be dived into in M21(which I don't see happening at the moment), he could potentially play a role in the plot. What aspects in them do you consider feminine "to a certain extend"? My reasoning isn't the best but since we are talking about traditional things that Gosho has done. It is undeniable the 3 suspect thing has normally been the case especially with the past BO suspects. 17 years ago, Iori Muga would've been 13 years old. I think it's a bit unfeasible that the BO would give a 13 year old a codename and entrust him with the task of assassinating someone. Furthermore, the disguise that he applied in the recent case was quite rudimentary, like something that Yukiko would've done. Rum's allegedly a master of disguise. He also doesn't have a glass eye, since Conan probably would've noticed something like that and panicked like he normally does. unless Gosho goes with the "Vermouth" route, in terms of his condition. 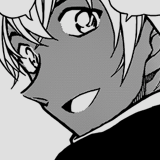 Otherwise, maybe he was an insane prodigy at that time, He could have used his youthful appearance to fool people and sneakily assassinate them(hence why the Boss bets so much on him). Swagnarok wrote: Rum's allegedly a master of disguise. Swagnarok wrote: He also doesn't have a glass eye, since Conan probably would've noticed something like that and panicked like he normally does. Glass-eyes aren't always visible. Since he was wearing glasses and stood at the side-lines through out the whole case, it would be hard for Conan to pick-up anything. Does Iori have an old-fashioned japanese speech-pattern? He sounds like an older butler and proper in the english translation(which I can't really go with). if so, he passes all the "contradicting" descriptions. I don't think anyone said that Momiji is a Rum suspect. Vermouth is unlikely to be any of the suspect characters, especially not Rumi. Vermi has zero reason to hang around Conan right now and Haibs prob would have noticed. If Gin wanted anyone to spy on Kogoro, Vermouth is not his pick, especially because Vermouth already opposed him very directly on the Kogoro topic back in Kir's intro case. I think you are Betting way too much for Iori, I still think He is more of a Heiji related plot, rather than BO related plot. And Probably he will feature in M21. Definetly. We haven't really heard the way he speaks, after all mere words can't describe voice can it ? Chekhov MacGuffin wrote: Vermouth is unlikely to be any of the suspect characters, especially not Rumi. Vermi has zero reason to hang around Conan right now and Haibs prob would have noticed. If Gin wanted anyone to spy on Kogoro, Vermouth is not his pick, especially because Vermouth already opposed him very directly on the Kogoro topic back in Kir's intro case. Who says she's following orders. I'm not, I'm simply pointing out his potential to be involved in the story, seeing as he clearly has a character design that fits Rum/Asaka. I never said anything about voice either. I'm referring to the specific words he chooses when he speaks, if it's old-fashioned or not. There's like three different accounts of what he looks like. This would imply that he meets different people while using different disguises. Wouldn't know, don't have access to the latest manga (if I did, I could probably figure out Rum's identity, lol). At least in American fiction, it's a common trope for the butler to be this elderly British gentleman. Perhaps that influenced the way that Gosho/the English translators depicted his speech patterns? That's a made up fact. 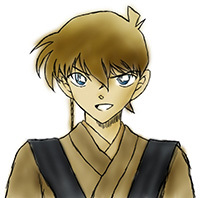 All known info about Rum is on the DetectiveConanWorld wiki page for him. That's why I started by saying she has no reason to be around Conan and Ai - no motive. If she had a reason to do so after the Vermouth arc, we would have had all of the Kir and Bourbon arcs to see her do so. Nothing has changed to require Vermouth's interference. Besides with Amuro close to Conan, she has a higher risk of getting caught, and we know Vermouth does not trust Amuro 100% with the blackmail he has on her. Then we have Ai's smell sensor, Conan's sharp mind etc, etc. I brought up Gin in order to preempt any sort of argument that his suspicions of Kogoro could have led to Vermouth hanging around. He wouldn't give her orders in the first place because he doesn't trust her, and he knows because she told him Kogoro has importance to her. And if it's the boss giving Vermouth orders because Gin told his overseer was still suspicious of Kogoro? --Not likely. The last time Gin told the boss he was suspicious of Kogoro, Chianti and Korn came with to murder the detective. If the boss started at "kill him", why take a step back now? I did. Since DCTP ate my post when I skipped out for an errand, and I don't want to try to rewrite it, I'll just get to the point. The logic in the Vermouth section was specious and entirely unconvincing. There are clue quality tiers: Top tier is stuff a character does and concrete signs, next tier is stuff characters say. Tangential side references (e.g. "the episode is about Yaiba's nemesis' second in command") are bottom of the barrel. Trying to figure out their "purpose" is walking into the trap, knowing it is a trap. That's because they are the author-trying-to-make-you-think-a-certain-way-without-actually-having-real-evidence clues. Re Haibara's BO radar, she is the most reliable when a Black Operative fires up their game face and makes someone's day. 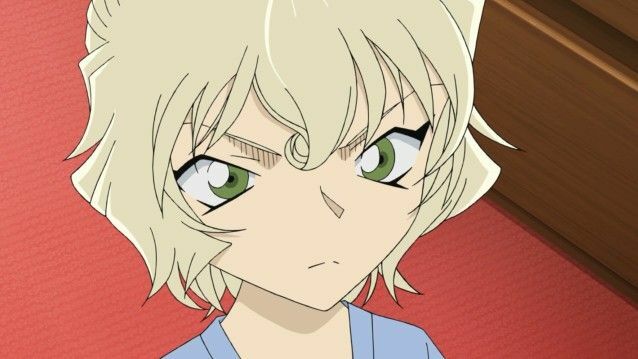 For Rumi to be Vermouth, interact with Haibara directly, and beat the crud out of bad guys twice with Ai around, and not set off Ai's radar is out of character for Haibara completely. I'm speculating based on Gosho's pattern and style of foreshadowing. Your so-called "bottom-of-the-barrel" has never ended up being lies. They've just always been vague enough to either be dismissed or misinterpreted. The story progresses, and what was once a reliable radar can end up being as unreliable as Yamamura. As I addressed, what Gosho introduced in the Bourbon arc(File 856) is suggesting inconsistency in her abilities, right after her fake death. Vermouth was full-on action-mode when she fell on Jodie to retrieve the bug(as seen with her evil smirk)(file 852), and Haibara didn't react one bit. Chekhov MacGuffin wrote: I did. Since DCTP ate my post when I skipped out for an errand, and I don't want to try to rewrite it, I'll just get to the point. The logic in the Vermouth section was specious and entirely unconvincing. There are clue quality tiers: Top tier is stuff a character does and concrete signs, next tier is stuff characters say. Tangential side references (e.g. "the episode is about Yaiba's nemesis' second in command") are bottom of the barrel. Trying to figure out their "purpose" is walking into the trap, knowing it is a trap. That's because they are the author-trying-to-make-you-think-a-certain-way-without-actually-having-real-evidence clues. I'm speculating based on Gosho's pattern and style of foreshadowing. >>>>Your so-called "bottom-of-the-barrel" has never ended up being lies.<<<< They've just always been vague enough to either be dismissed or misinterpreted. I recall oppositely, and I did research for several meta-info type wiki pages that examine the types of clues Gosho gives out. The fundamental problem with these types of hints is that they 1) Don't mean anything concrete like actual clues. 2) Are like tea leaf predictions which take the shape of whatever the theorist wants to see. That makes them doubly useless -- and that's one of the reasons why Gosho uses them. They are traps. Distractions. Smoke and mirrors. Red herrings. It's logically easy to look back after you know the solution and say they mean a certain thing, but that's your personal bias, trying to force the data to a known solution. Was that one restaurant "Aska" where Okino Yoko and Higo "dated" a sign that this case was plot significant, or a meaningless tease? Were the crows that appeared at the burned apartment building in Okiya's intro a sign that the Black Organization is lurking, or simple foreboding to make Okiya seem creepier? Did the hunt for the Chocolate Black Spy commercial mean we were supposed to pay extra attention for the spy-like Bourbon in the white day case, or was it just some random case story Gosho inserted? MeiTanteixX wrote: The story progresses, and what was once a reliable radar can end up being as unreliable as Yamamura. As I addressed, what Gosho introduced in the Bourbon arc(File 856) is suggesting inconsistency in her abilities, right after her fake death. Vermouth was full-on action-mode when she fell on Jodie to retrieve the bug(as seen with her evil smirk)(file 852), and Haibara didn't react one bit. Retrieving a bug is just a bit different than smashing a face in.